Four sweet cherry, three sour cherry trees. I am grateful to have them, to be able to pick the fruits and give to others: neighbors, family and friends. In the meantime I appreciate more and more all the people who choose fruit growing as a profession. We were worried about aphids, then about too much rain, about illnesses, then about the strong wind. Then it is another challenge, when we pick them, how we store them and how to process them. 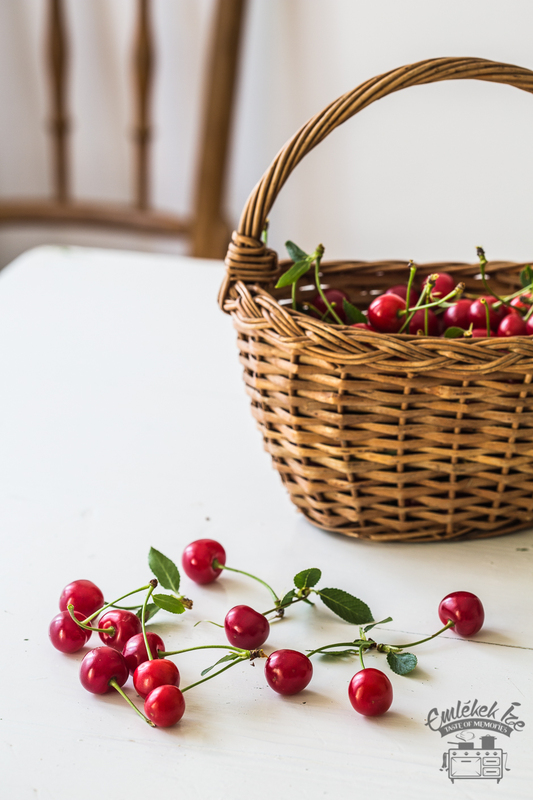 But still, it is such a big pleasure when the basket is full, I grab a handful of the cherries and go to the kitchen to transform them to salad, cake or fruit soup. I set the ladder under the tree, put a wicker basket on my arm and a straw hat on my head. The reason for the hat is not to be stylish, more it comes from experience that it is more practical to have it than to remove all the leaves and rest of flowers from my hair afterwards. Beeper, my dog also tries to participate in the project, she drops her toy into the basket and try to convince me to play with her instead of picking fruits. Sometimes I wish I could fly and had 6 hands because actually the highest branches have the most beautiful fruits. The fruits on the highest branches become a subject of conversation with the neighbors. Tomi comes up with the idea that if the weather is bad they can come over with their tractor and lift me up to reach the peak. Altough I find the idea really funny I cannot count on them, sunny days follow each other so they have enough work to do at the fields. Of course while picking I have to test the cherries: which tree has the tastiest fruits? Is the sour cherry ripe enough or should I wait one more day until it gets a bit sweeter? Obviously it is difficult to decide from one single fruit, so I have to check more of it, and if I can pick a pair of cherries I hang it on my ears, as I used to do when I was a child. My hands and my mouth are already purple but I only stop when I need to move the ladder. A tree has yellowish-reddish cherries, my grandmother calls it “strudel cherries” but officially it is called Vega and is a race which comes originally from Canada. My other neighbor, Tibor knows the stories of each tree. He brought the three sour cherry trees when the nursery garden closed where he used to work. They ripen one after the other one, so sour cherries can be picked continuously. 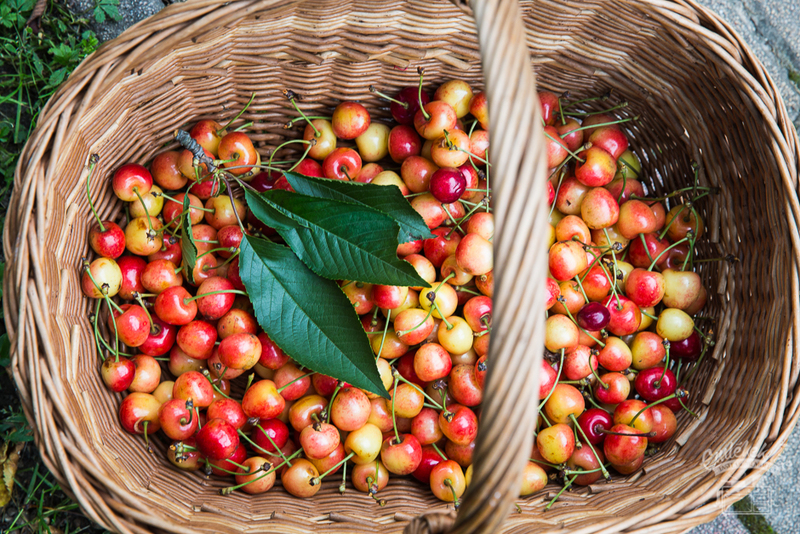 A cherry tree is originated from a wild race, it has a slightly bitter taste and sometimes has worms. “Doesn’t matter, you need some meat anyway, don’t you?” – he adds while he tries to hide his smile. I give him right, the dark, shiny cherries are calling me and I can tell you despite of its slight bitterness I really like it. 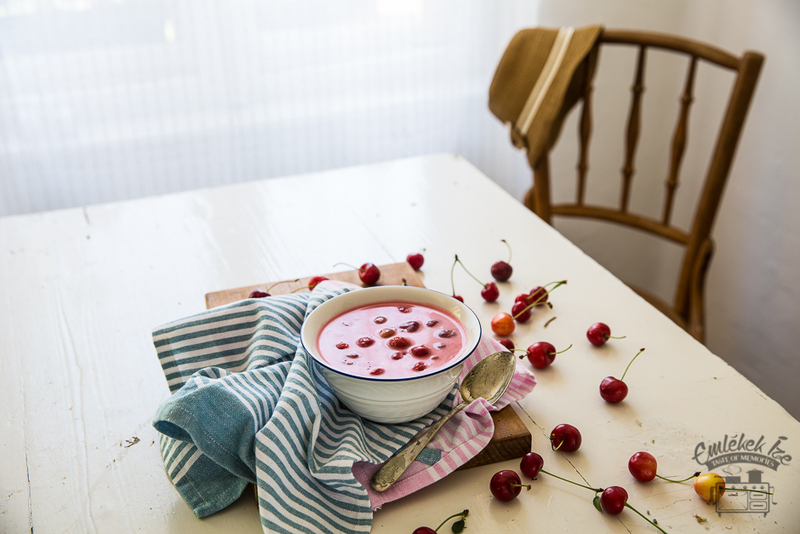 The other cherry tree, the one which is quite high has the best fruits, it is a resistant race on the top of it, but I can only reach a few cherries which land mostly in my mouth. The garden at that point is too steep, if I set the ladder it will immediately fall over, with me on the top. Hopefully next year we will be able to rejuvenate it by pruning. My wicker basket is full and I think about how many different things I could make from this fruit: jams, syrups, pies and strudels. 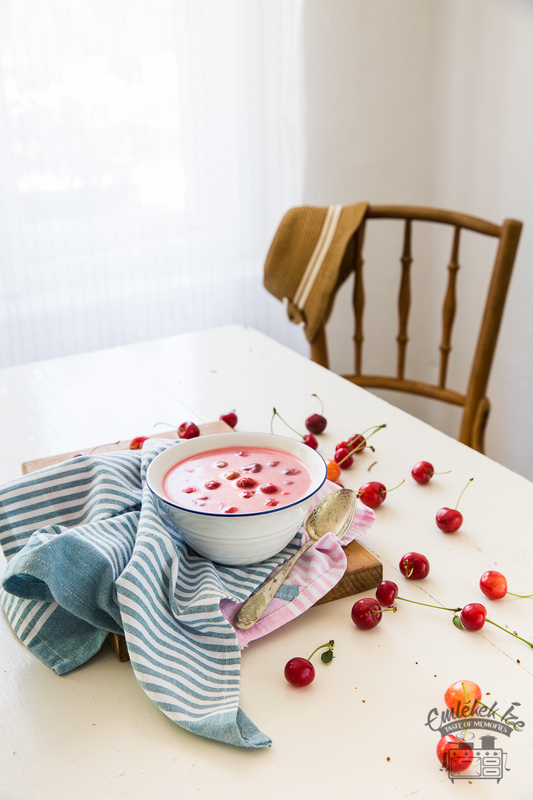 But now I need something really refreshing, so I will cook a fruit soup which only takes ten minutes and the time I cool it down. 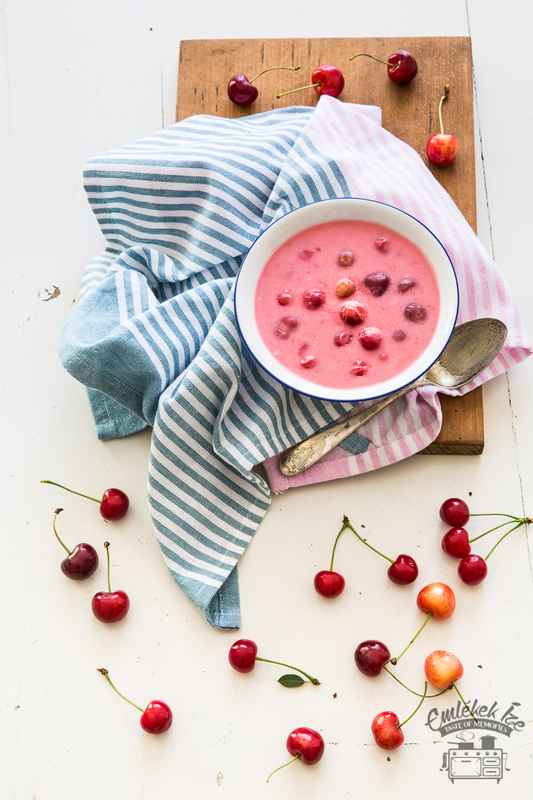 A bowl of ice-cold fruit soup…I really don’t need anything else to perfect happiness. Maybe only one thing: a pair of sour cherries, to hang on my ears. Put the fruits in a pot except the soft ones which don’t need a longer cooking process. Add the sugar, the cinnamon and vanilla bean and just enough water to cover the fruits. Bring it to boil and cook it for further 5 minutes. Mix the cream with the flour and vanilla pudding powder and add it to the soup stirring continously. Add the soft fruits and cook it for a few minutes until it thickens slightly. Remove it from the heat and add lemon juice from which it gets its wonderful pink color.